Delhi has topped the state investment potential index list, followed by Tamil Nadu. The index prepared by economic think tank National Council of Applied Economic Research, showed that Delhi topped the rankings on infrastructure and economic conditions of the state. NCAER launched the index in March 2016 to provide metrics of economic governance, competitiveness and growth opportunities at the state and regional levels. The index is designed to provide a systematic and reliable “go-to” reference for policymakers, existing businesses, and potential domestic and overseas investors. Tamil Nadu was in second place and topped the rankings in labour and governance. 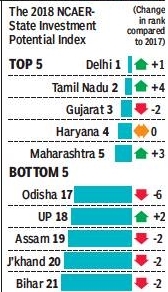 Compared to 2017 rankings, West Bengal, Tamil Nadu and Punjab have made the most rapid gains in 2018, moving up by 11, 4 and 4 spots respectively to 10th, 2nd, and 12th positions. The index ranks competitiveness of states on six pillars: land, labour, infrastructure, economic climate, political stability & governance, and business perceptions. These six pillars are classified under four broad categories: Factor-driven (land & labour), efficiency-driven (infrastructure), growth-driven (economic climate and political stability & governance), and perceptions-driven (ranking of business climate built on firm surveys). Although Assam, Jharkhand and Bihar are ranked among the least favourable states for investment, they are ranked higher under individual pillars.